a grove is a potential sanctuary between the worlds. and guided by the spirit. without a lot of other symbols. In this way I have kept the piece open and free of restraint. set into a cluster of leaves. while maintaining the intent of the piece. and protecting the stone from possible damage of a direct hit. then expanded these protective enclosures to other designs. of exploration of one’s self and the world. of one’s life and the Truth that awaits. 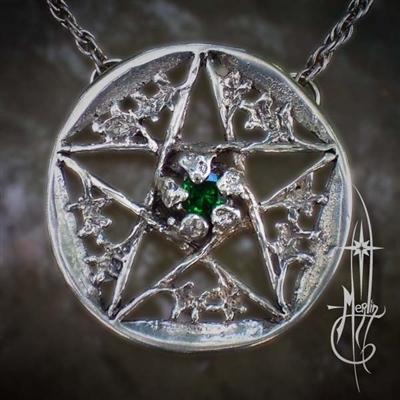 To view the Oak Pentacle Amulet with Stone, please visit my website.